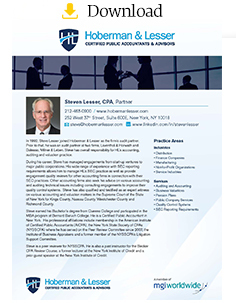 In 1992, Steve Lesser joined Hoberman & Lesser as the firm’s audit partner. Prior to that, he was an audit partner at two firms, Laventhol & Horwath and Dalessio, Millner & Leben. Steve has overall responsibility for HL’s accounting, auditing and valuation practice. During his career, Steve has managed engagements from start-up ventures to major public corporations. His wide range of experience with SEC reporting requirements allows him to manage HL’s SEC practice as well as provide engagement quality reviews for other accounting firms in connection with their SEC practices. Other accounting firms also seek his advice on various accounting and auditing technical issues including consulting engagements to improve their quality control systems. Steve has also qualified and testified as an expert witness on various accounting and valuation matters in the Supreme Court of the State of New York for Kings County, Nassau County, Westchester County and Richmond County. Steve earned his Bachelor’s degree from Queens College and participated in the MBA program at Bernard Baruch College. He is a Certified Public Accountant in New York. 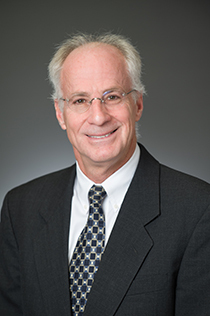 His professional affiliations include membership in the American Institute of Certified Public Accountants (AICPA), the New York State Society of CPAs (NYSSCPA) where he has served on the Peer Review Committee since 2007, the Institute of Business Appraisers and a former member of the NYSSCPA’s Litigation Support Committee. Steve is a peer reviewer for NYSSCPA. He is also a past instructor for the Becker CPA Review Course, a former lecturer at the New York Institute of Credit and a prior guest speaker at the New York Institute of Credit.